Red winged blackbirds, scores of robins and the end of daylight savings time have tuned me in to the fact that spring has finally arrived. However, for those who live in the country, especially for those with a pond (any size will do), the surest sign of spring's arrival is the return of the Canada Goose. In the spring of last year, when we first viewed the property with the listing agent, a long time country resident herself, we talked about the pluses of living in the country, especially for our children. As we neared the pond, surrounded by geese, she quickly commented, "I'd be getting rid of them in a hurry". While I have always enjoyed watching them interact with each other in their comical way; the thought of dodging goose poop all summer certainly wasn't enticing. She continued on, telling us she also had a pond and stated, "I usually shoot one every year and leave it lying by the pond to serve as notice for the rest of them." My husband who, good or bad, always has a story for a story, relayed his experiences living near a large lake and how the city would tie string along posts placed at the edge of the water, a few inches off the ground. It seems the geese can't climb over the rope and therefore can't access their nests along the shoreline. I dare her say her chin dropped a little before she chuckled and sheepishly said, "Well, I suppose that's a more humane way of tackling the problem!" This year, our children were sitting at the back of the house on a Sunday afternoon when they first noticed the geese. "I see eight of them!" our daughter announced happily. I quickly counted, coming up far short of eight. "I only see three, no...wait, five," I replied. No sooner did I get that out when from out of the creek that feeds the pond, up popped two heads which went back down just as quickly as they came up. It seems they were eight in total and they were having their weekly bath in the freshly thawed water. A few minutes later, as if showing off for us, they all waddled across the pond. They were slipping and sliding along the ice, chasing each other and having, what seemed to us, great fun. Apparently, we weren't the only ones who enjoyed a little recreational time on the ice this year and they were officially the last 'skaters' this winter. 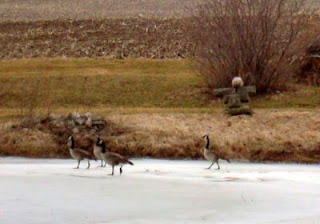 With the arrival of the geese then, I wasn't the least bit surprised when my husband went into full 'pond patrol'. Each day when I returned home from work, my first gaze would be directed to the back of the pond, hoping to snap a better picture of our Olympic skaters. My hopes were dashed upon entering the house; as I would hear my husband regaling his heroics of chasing them away throughout the day. Within a few days, we were down to one pair, determined to make our pond, or in their minds I'm sure it was their pond, a home for their future babies. I casually mentioned to my husband how cute it would be to have some little ducklings to watch growing up on the pond. His reply, which would make any girl cringe, at least one who is trying her best to convert from city dweller to country girl, was, "You can tell you're not from the country!" Now that was a low blow! Day after day, they returned only to be chased away, again and again. On one of their last attempts they flew away, just far enough to keep an eye on my husband, and headed back towards the pond as soon as they saw him retreat to the house. I can't deny feeling a bit of karma gratitude as I watched my husband get 'faked-out' by a pair of expectant geese.